I guess you will all be glad to hear about something besides our move. But not having moved in 23 years makes me wring my hands, worry a lot, lose even more sleep than usual, and generally think of this as truly life changing. Which it always is, whatever one’s circumstances. But for an artist, I think it’s even bigger. I had a chuckle all to myself yesterday out in the space that was my garage studio. I had avoided it long enough and finally had to decide how I was going to pack all of my collage papers, collected over years of choosing and accumulating wonderful handmade papers, magazine pages, bits of fabric, lace, trim, buttons, and thread, pellon for making templates, stencils, cutout shapes for tracing, and the list goes on. 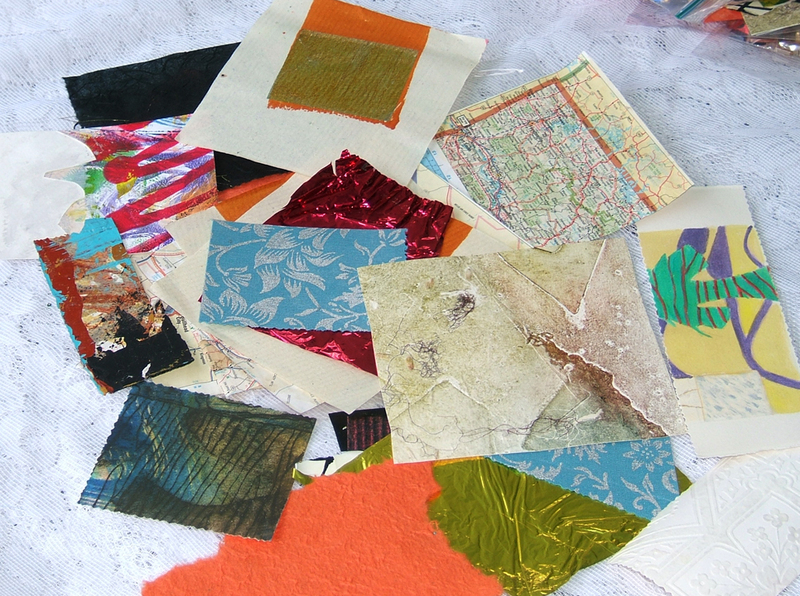 I imagined the conversation between my husband and myself should he catch me in the act of boxing up “just a bunch of paper.” Only an artist can understand the need for rich variety in creating collage. To a civilian it’s just a bunch of paper. But to an artist, those are the palette and the paints, and they can’t just be purchased like regular art supplies. I taped the box as fast as I could, so we wouldn’t have to have that conversation. There’s another rather small box containing everything to make marks with, excluding my acrylic paints. There are watercolors in tubes, fabric paints, silkscreen inks, gouaches, both chalk and oil pastels, watercolor pencils . . . and even some crayons. Another box holds my papermaking supplies, including a stash of really nice thick cotton linters, some wonderful papers, (more paper!) and some small hand-built frames and deckles — a collection I put together in order to teach a one-day workshop a few years ago. Papermaking is such a delight — so clean and thoroughly pleasurable. Naturally I couldn’t throw that out, so it’s neatly packed up and labeled. Then there are the encaustics that I put together one summer. Those supplies, including beautiful colors of paints that I mixed beginning with beeswax and damar resin, slowly heated and dissolved, then portioned out and combined with oil paints, and the sacrificed big electric griddle, will be boxed together. To make encaustic paints is a labor of love. Nope, not leaving those behind either. The fun part is knowing I’ll be organized at least one more time in my life. I’m not sure how soon that will be, but there’s no big rush to get it right. Yes, Karen — I can’t even imagine someone else being the decider in those matters! I know what you mean about all of your special art supplies. I am a paper-a-holic and . . . you can’t have too much. It is a big task- moving and as you said: even bigger for an artist. I’ll keep checking your progress and sending you ‘good energy’ for the move. Thank you, Jane! I appreciate the good vibes. Beautiful blog you have there. And I love Mocha! Good energy from me too Martha. Your art supply collection is amazing – no wonder you are so creative. Last time I moved was 1986, long before I developed a number of interests that generate “stuff”. That was the 4th move in about as many years and I decided then that the people who do my next move will be the local funeral directors! Thanks, Sandra. Lots of parallels: We have moved a total of only four times, and it was all before 1986. So I do know exactly what you are talking about. I never thought we’d be moving again, an attitude that allowed me to freely collect art stuff over the years. I know what you mean, but I have moved so many times that I officially nicknamed myself the GyPsy! I like it, Fadwa! And I like your blog. Thank you for popping in and introducing yourself. I promise to get over there to read and comment when I get where I’m going. I’m so glad you are enjoying the blog. It’s people like you who make me want to keep it going. I have awarded you the Bella Sinclair award. It is for friendship, sisterhood, caring and sharing. I while ago I contacted you regarding your article on how to get a body of work together. I wanted to pass this award on to you to thank you for your article and for your kind words. You were very encouraging and inspiring. Tammy, I’m delighted and flattered! Thank you. I’m happy you have gotten something good from that article. And I love your paintings!